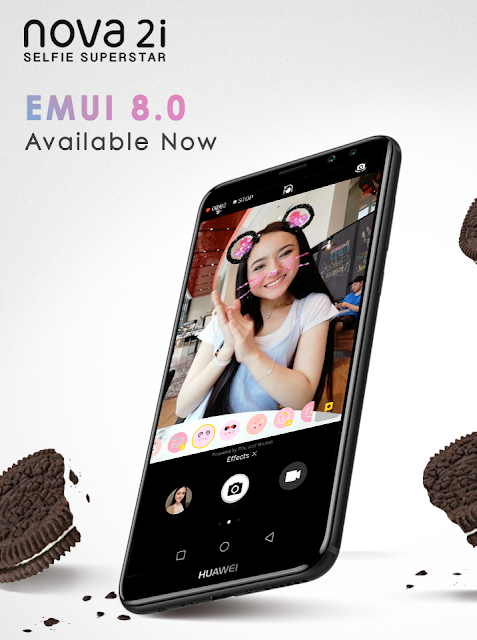 Following the beta testing of EMUI 8.0 Oreo for HUAWEI nova 2i users in March, HUAWEI, Malaysia’s second largest smartphone brand, officially announces today that the software EMUI 8.0 and Android 8.0 are available for progressive updates for all HUAWEI nova 2i users starting today onwards. Translating the AI capabilities into heightened user experience, the EMUI 8.0 is able to predict users’ intentions, and provide intelligent recommendation to the function that users need in order to improve smartphone’s efficiency. It includes a navigation dock where users can place the home button freely on the screen along with the shortcut dock, and you are set to go. It also helps users to launch a shortcut menu, drag and drop to create a desktop shortcut for efficiency of the phone. Based on machine learning, EMUI 8.0 allocates resources dynamically to provide more CPU memory to the apps that are frequently used by users, with an aim to deliver smooth smartphone experience. Low memory management actively rearranges memory space to reduce fragmentation, and compress memory to save space for more important applications. Combined with Android 8.0, HUAWEI nova 2i users can experience a smarter, faster and more powerful smartphone like never before. The update enables users to get started on one’s favourite tasks more quickly with 2x the boot speed when powering up (boot time as measured on Google Pixel). It also allows users to view two apps concurrently to improve productivity, to name a few features. Retailing at RM 1,099, the HUAWEI nova 2i encompasses a dazzling 5.9-inch HUAWEI’s FullView Display, four cameras and smart ambience front flash light. Powered by a 16nm 8-core Kirin 659 chipset, it clocks up to 2.36 GHz. It runs on a 4GB RAM + 64 GM ROM that can help manage multiple tasks effortlessly. HUAWEI’s state-of-the-art camera technology also allows users to readjust the focus after shooting, while enabling users to choose different bokeh effect. For more information on the EMUI 8.0 and Android 8.0 update for HUAWEI nova 2i, please visit http://consumer.HUAWEI.com or HUAWEI’s official Facebook page www.facebook.com/HUAWEIMobileMY.